The Bertazzoni 36" French-door stainless steel refrigerator is designed and engineered with the highest grade materials and components. Using one of the 3 available handle kits in Professional, Master and Heritage Series style, this refrigerator integrates seamlessly with all other Bertazzoni appliances into style-harmonized suites for a true, high-performing kitchen. This counter-deep refrigerator has ample storage capacity, with 15 cubic feet of refrigerator volume and 6 cubic feet of freezer. Dual No-Frost air-cooling system for the separate refrigerator and freezer compartments provide optimal temperature and humidity control to keep food fresher longer. The internal configuration of the upper compartment is designed for maximum flexibility, with glass shelves that move and fold, high-capacity drawers and crispers with dedicated temperature and humidity controls, and several gallon-size storage bins in both doors. 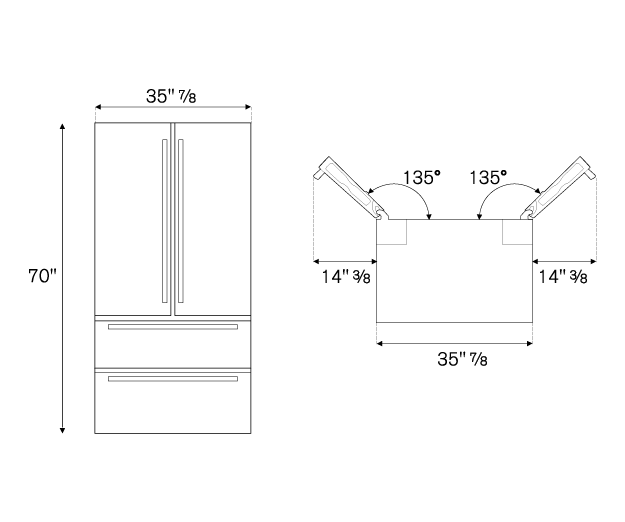 Two freezer drawers allow easy access, and the top compartment holds the tray for the automated ice-maker.